Take a walk outdoors in any suburban area and it is difficult to avoid the sounds created by the mechanical inventions in our modern society. The drone of an aircraft passing overhead, the rush of vehicles from a busy street or the buzz of a lawnmower in the neighbor's yard create a measurable soundtrack to our daily activities. Most of us are pleasantly surprised by just how quiet it becomes when these sounds suddenly stop and we are exposed to the underlying level of quiet that is present. We cannot eliminate these noises entirely, but by applying our GreenTech philosophy of continuous design improvement during our product development, ebm-papst can again help engineers create air moving systems that are found outdoors that we can comfortably live with. In congested cities, with living spaces adjacent to supermarkets and small industry, the need for quiet operation is not just desired, it is mandatory by local codes. Fans that are used to move large amounts of air to cool our mechanical equipment or keep our refrigeration systems running are necessary components in the systems that are placed on rooftops and the outside of our buildings. Engineers and designers work very hard to meet the strict guidelines that are put in place to limit noise but these restrictions can negatively affect their final designs. To lower noise in these applications, there are standard "fixes" that the designer can call upon to help meet the required noise and performance levels. With axial fans, the common fix is to reduce the motor RPM and increase the number of fans to handle the air performance needs and or increase the blade size. These solutions can lead to a reduction in system performance, add components increase the system footprint and increase energy consumption. Not an appealing solution with today's high electrical costs, small installation areas and increased refrigeration costs. Even worse, in many cases, these changes are not always effective and further fixes must be done on site where additional changes are even more costly. AxiTop from ebm-papst, a leader in air moving technology, offers a groundbreaking solution. 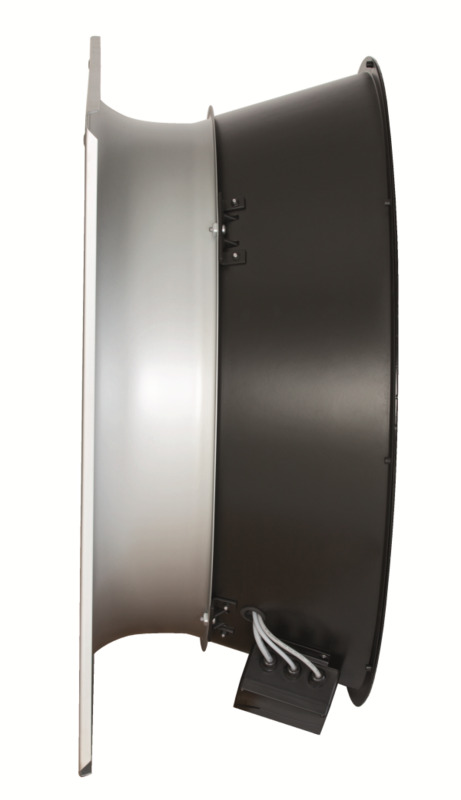 We have combined our high efficiency AC and EC axial fans with a passive diffuser assembled in one complete package to help simplify installations. Our optimized AxiTop design has been shown to reduce noise lower energy consumption when installed in typical applications. Integration of this assembly is simple. The fan and diffuser are delivered as a complete assembly that can easily be integrated into an existing design using our standard square wall plate. Or custom wall plates are available so that the AxiTop fan assembly can be integrated seamlessly into your air handling system. AxiTop is currently available worldwide in 800 and 910mm diameter axial fans. These popular sizes are perfectly suited for use on rooftop condensers, fluid coolers, and agricultural ventilation applications. If you need a real solution to meet applications with low noise requirements and at the same time reduce total cost of ownership and simplify your design, our AxiTop product line provides an answer! Please visit us at booth #2967 at the upcoming AHR Expo in Dallas, TX, to see the AxiTop units on display and for a complete overview of this exciting new product. Or contact us at sales@us.ebmpapst.com to review the benefits of using AxiTop.